GRAMBLING, La. — Today, Gov. 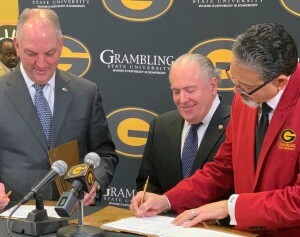 John Bel Edwards joined Grambling State University President Rick Gallot and Louisiana Economic Development Secretary Don Pierson to sign a $1.2 million Memorandum of Understanding which will advance technology careers for Grambling State students. Through the MOU, Grambling State and LED will establish a Technology Advisory Council that solidifies industry relationships with leading technology employers, including CenturyLink, IBM, GDIT, Microsoft, DXC Technology and CGI. Those relationships will strengthen university degree programs in computer science and computer information systems, while also informing Grambling State’s new cybersecurity program, Louisiana’s first bachelor’s degree in cybersecurity. Grambling State faculty will participate in externships with major technology employers in Louisiana, and students will benefit from scholarships, internships, apprenticeships and other work-based learning opportunities that align student learning with the needs of technology employers. This entry was posted in awards, events on February 12, 2019 by Jovan Hackley.